Situated along the Arkansas River and Lake Dardanelle in the heart of the Arkansas River Valley, Russellville, Ark., is known for having plentiful high-quality freshwater. Nearby springs from the surrounding Ozark and Ouachita Mountains are valuable resources, providing an abundance of freshwater to the town’s residents. As Russellville’s water and wastewater utility, City Corp. provides services for nearly 11,000 water customers and 10,000 wastewater customers. The utility strives to ensure its customers have the best water in the state year after year. Prior to working with Badger Meter, City Corp.’s largest challenge was managing non-revenue water loss, or the cost of water pumped into the system versus what customers are billed. Hovering around 18% to 19%, its non-revenue water loss was considerably higher than the goal of 10% or less. City Corp. wanted to provide safe, high-quality and good tasting water to its customers at a fair price. When the utility was losing water at such high rates, providing service at a fair price became much more challenging. Recognizing the need for a new approach, City Corp. leaders began looking for possible solutions. After learning about Badger Meter’s capabilities, City Corp. selected the company’s BEACON advanced metering analytics (AMA) managed solution with cellular endpoints, and E-Series ultrasonic meters. Because the system uses cellular networks, City Corp. did not need to install new gateways or other fixed-network infrastructure. This flexible cellular solution allowed the utility to deploy the system when and where it wanted and install it alongside its existing system. With the new AMA solution, City Corp. can now track unaccounted-for water on a daily basis, with accurate, real-time consumption data, eliminating the lag time from monthly manual meter readings. Notifying customers of a potential leak within 24 to 48 hours after receiving the data, instead of within a 30-day billing cycle, also has helped to decrease unaccounted-for water percentages. City Corp. is able to identify potentially harmful leaks, notify customers and resolve issues faster than before. Cellular networks and real-time data also save City Corp. gas, money and time. Because employees can see the data on a laptop and determine if there have been significant changes overnight, fewer staff members are in the field reading meters. This frees up staff to take care of other projects that previously had been on hold. The stainless steel ultrasonic meters have helped reduce lead in the city's water system. City Corp.’s previous water meters contained lead. Because of the age of the system, the lead levels exceeded the minimum requirements allowed by U.S. low-lead standards. Moving to stainless steel ultrasonic meters helped the utility reduce the lead in its water system. The meters also monitor consumption, flow rate, reverse-flow indications and alarms, and because they have no moving parts, the ultrasonic meters provide reliability and a long life expectancy. 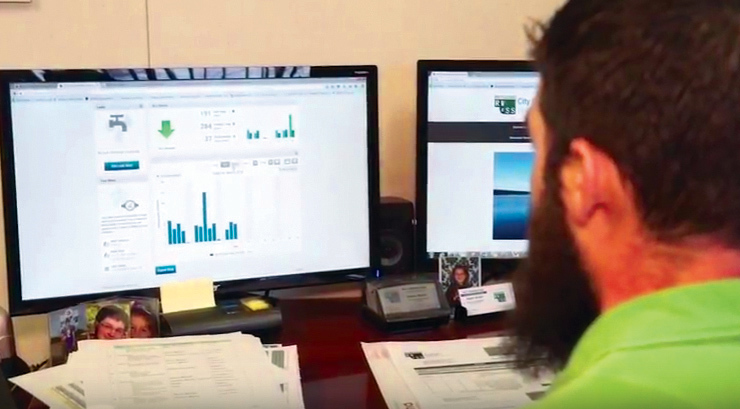 With the AMA managed solution, City Corp.’s customers also have access to a mobile application that allows them to take a hands-on approach to monitoring their water usage. Customers can see their own consumption patterns through a web portal or on their tablet or smartphone. They can set alerts for high consumption or for when their usage has reached a certain level. In turn, the app has helped City Corp. more efficiently respond to customer questions and concerns. Russellville’s water is consistently ranked best in the state. Last year, it ranked best in three states, and in 2016, it was voted the people’s choice winner for best tasting water in North America at the American Water Works Assn. annual conference. City Corp. wants the city’s water system to last for years to come. Having a solid and accurate infrastructure and metering technology will help. With more accurate measures of unaccounted-for water, real-time data to monitor for leaks, reduced lead in the system and more accessible information for customers, City Corp. is helping to ensure that Russellville continues to produce quality drinking water. Kristie Anderson is product marketing manager for Badger Meter. Anderson can be reached at [email protected] or 414.371.6215.